At 1¾″ long, eyed click beetle (Alaus oculatus) may be the largest click beetle in our area. With its boldly-outlined eye spots it is certainly the most distinctive. The body is long, thin, and black, with mottled patterns of minute, whitish scales. The thorax has a pair of large black spots boldly outlined with white. The spots look like eyes and give this beetle its common name. On the underside, an elongated lobe on one plate fits into a groove in another plate, allowing the insect to produce an audible click. 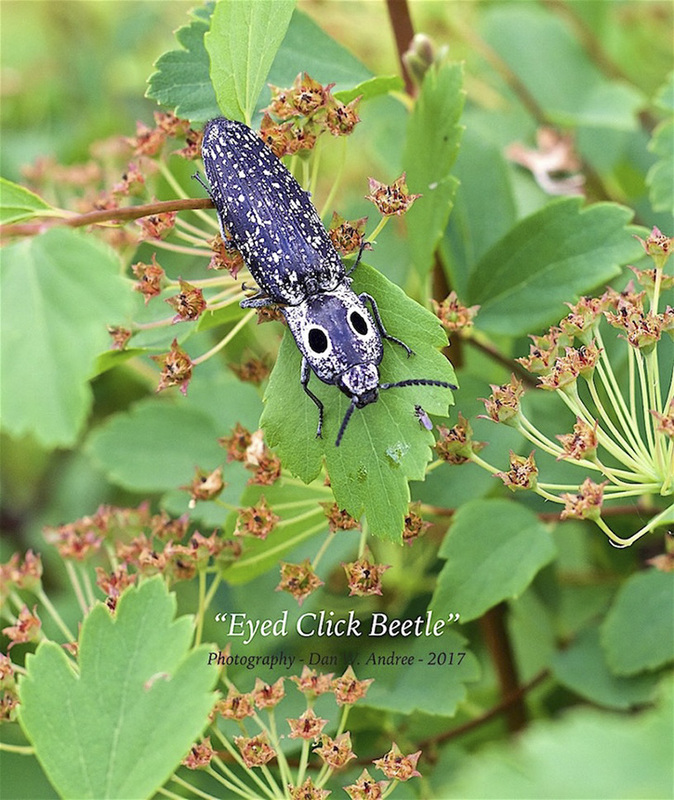 This feature gives the insect family the common name “click beetles”. If put on its back, the beetle uses this click mechanism to catapult itself up to six inches in the air, righting itself and potentially escaping a predator. Click beetle larvae are called wireworms. Most wireworms eat plant roots, and can be serious agricultural pests. Eyed click beetle wireworms are carnivorous. The feed on the larvae of other insects, especially wood-boring beetles. This makes them a beneficial insect. This entry was posted in Insects and tagged Alaus oculatus, eyed click beetle on February 4, 2018 by John Valo.